Eating an occasional cup of yogurt isn't going to make your hair grow at twice its normal rate, but eating yogurt regularly may help you keep your hair strong and healthy. In addition to giving slow-growing hair a boost, yogurt has other health benefits -- it's packed with calcium, and if you choose a type of yogurt low in sugar and fat, it can be a filling low-calorie addition to your diet. Yogurt's benefit, as far as your hair is concerned, is its protein content. Protein is an essential nutrient to the growth of your hair and nails as well as your internal organs. If you don't eat enough protein, your body will automatically divert the protein it does get to support your organs, leaving your hair unable to grow. Adding more protein to your diet signals your body that it can use some of the nutrients for growing your hair and nails. However, if you're already eating enough protein, adding more to your diet likely won't have any noticeable effect on your hair. Keeping track of your protein intake will tell you whether you need more to make your hair grow. The Centers for Disease Control and Prevention recommends that children between 1 and 3 eat at least 13 grams of protein a day, while children between 4 and 8 need 19 grams and those between 9 and 13 need at least 34 grams of protein per day. The CDC recommends that females 14 years old and older eat at least 46 grams of protein a day, while boys between 14 and 18 should at least eat 52 grams and men 18 and older need at least 56 grams of protein per day. 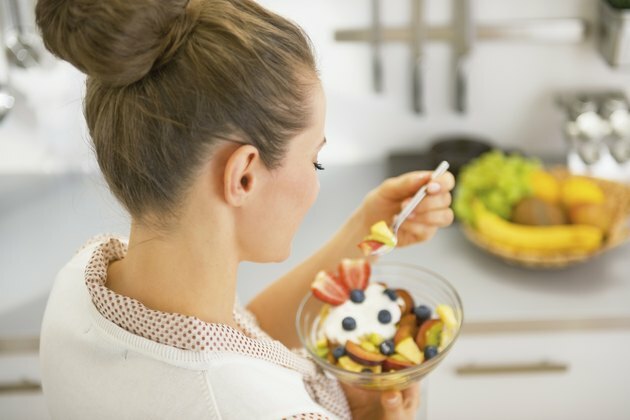 All yogurts contain some hair-building protein, but not all yogurts are created equal. Always read the nutritional label before buying any carton; the average 8-ounce carton will contain around 8 or 9 grams of protein, but could also contain 200 or more calories. Unless you can't tolerate cow's milk, avoid yogurts made from lactose substitutes such as almond or coconut milk, since these versions tend to have far less protein than the brands made with real milk. When protein is your main concern, Greek yogurt is the best option: some brands contain as much as 20 grams of protein per 6- or 8-ounce container. There's no magic spell or pill that will make your hair grow faster, but in addition to eating protein-rich foods like yogurt, taking proper care of your hair may help you get it to the length you want. Try massaging your scalp for a few minutes every morning and every night; in addition to leaving you feeling wonderful, this action will send blood and nutrients to your scalp and hair follicles. Getting your hair trimmed every six to eight weeks prevents split ends, which, left alone, will cause your hairs to break off.